In the above photo the honor guard assigned to the U.S. Indo-Pacific Command (INDOPACOM) move a flag-draped case from a U.S. Air Force C-17 Globemaster III aircraft during an honorable carry ceremony at Joint Base Pearl Harbor-Hickam, Hawaii on Aug. 1, 2018. 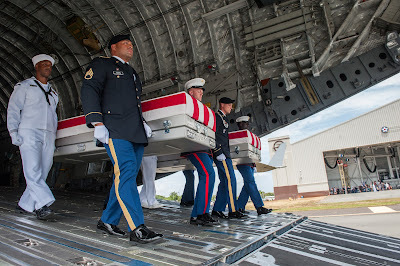 The United Nations Command recently repatriated 55 transfer cases from North Korea that contain what are believed to be the remains of American service members lost in the Korean War. The U.S. Air Force photo was taken by Senior Airman Apryl Hall. 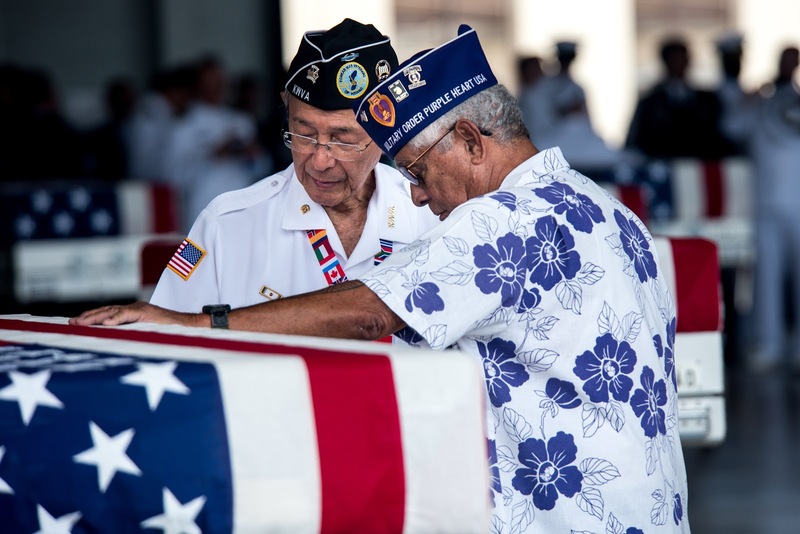 In the above photo the Defense POW/MIA Accounting Agency (DPAA) and U.S. Indo-Pacific Command conduct an honorable carry ceremony at Joint Base Pearl Harbor-Hickam, Hawaii on Aug. 1, 2018. Carry teams will move fifty-five transfer cases, containing what are believed to be the remains of American service members lost in the Korean War, to the DPAA facility at Joint Base Pearl Harbor-Hickam for identification. North Korea recently turned over the remains to the U.S. and is the first mass turnover of remains since the early '90s. The U.S. Air Force photo was taken by Senior Airman Apryl Hall. 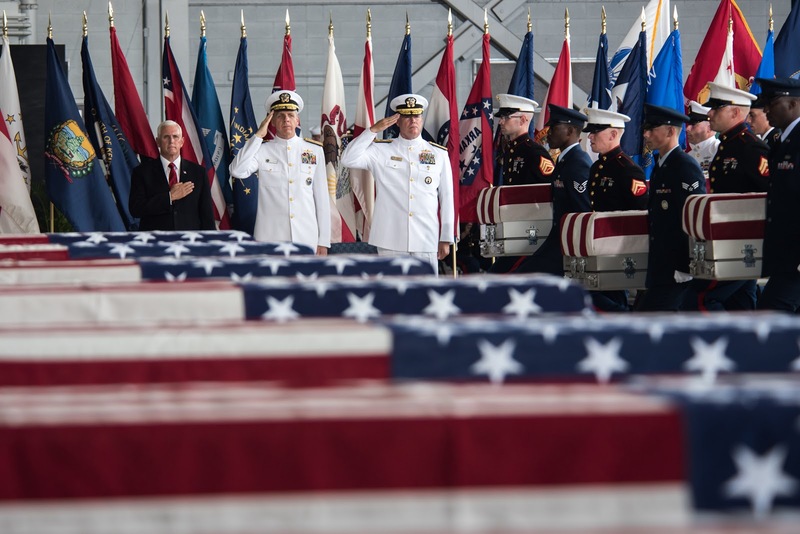 In the above photo an honor guard detail of U.S. Indo-Pacific Command (INDOPACOM) personnel conducts an honorable carry ceremony at Joint Base Pearl Harbor-Hickam, Hawaii, Aug. 1, 2018. 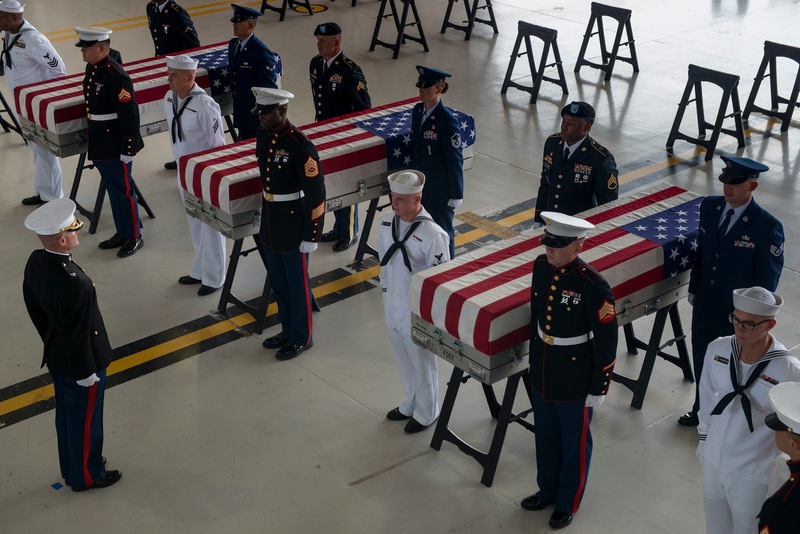 Carry teams will move 55 flag-draped transfer cases, containing what are believed to be the remains of American service members lost in the Korean War to the DPAA laboratory at Joint Base Pearl Harbor-Hickam for identification. The U.S. Air Force photo was taken by Staff Sgt. Mikaley Kline. In the above photo Korean War veterans pay respects after an honorable carry ceremony at Joint Base Pearl Harbor-Hickam, Hawaii on Aug. 1, 2018. The United Nations Command recently repatriated 55 transfer cases from North Korea to the U.S. that contain what are believed to be the remains of American service members lost in the Korean War. The U.S. Air Force photo was taken by Senior Airman Apryl Hall.